I spent this Sunday afternoon and evening two hours away at my parents. It was the perfect opportunity to try a recipe that I’m hesitant to try. I don’t really like canned salmon but it was a somewhat common ingredient in the 1890s and early 20th century. I discovered a few salmon recipes that I liked while cooking every day from the 1906 Berlin Cook Book. I’m hoping Fish Turbot is another of those recipes. It comes from Mrs. J. Mowat Duff and was published in the 1898 New Galt Cook Book. I started by measuring the milk. I wasn’t sure if the milk was to be hot when I soaked the onion or if that came later. I decided to soak it in cold milk and then heat the milk later. Then I realized that my parents don’t have onions (my father doesn’t like them). They did have some dried onion so I put a teaspoon in the milk and left the onion to soak for about 10 minutes while I started preparing the salmon. The cans of salmon in the 1890s seem to be a larger size than the ones I see in grocery stores today. However, occasionally it is possible to find a tall can of salmon instead of the short flat type. My parents had one but if you can’t find it just use two cans of salmon. I opened the can and put it in a bowl. I spent time picking out the skin and bones and then breaking up the chunks of fish. I strained the milk to remove the onion and put the now onion flavoured milk in a saucepan. I melted the 3/4 cup of butter and mixed it with two tablespoons of flour. I suddenly realized I was making a roux to thicken the milk. This cook book has several ways of making cream sauces and none are the method I learned as a child. Mrs. J. Mowatt Duff’s method was very effective. The butter and flour combination mixed well with the milk and I was able to turn up the heat. I kept stirring as the milk thickened to avoid burning or creating lumps. Once it was nice and thick, I removed it from the heat and left it to cool. I seasoned it with salt and pepper. I beat one egg and added it to the sauce. It was time to put the fish turbot together. I used a clear glass casserole dish as my pudding dish. This way the layers would show. Unfortunately I don’t have pictures. I first put a layer of the salmon and then sauce, another layer of salmon and then the final layer of sauce. I topped it with some bits of bread and popped the dish in the oven. I baked it at 350 F for about 30 minutes. The top was nicely browned and it seemed heated throughout. It was time for lunch! Mrs. J. Mowatt Duff is probably Louisa Caroline Nelles. I wrote about her just a few days ago when I made her boiled salad dressing. Fish Turbot was surprisingly good. Five people tried it and all but one really liked it. I was one of the fans. This is essentially creamed salmon but there are a few interesting details. The layering makes it look nice and the bread crumbs provide a nice contrast in texture. I am going to try the onion in milk technique again. My father doesn’t mind the taste of onion but can’t stand the texture. If you cook for someone with a similar aversion then this method is great compromise. I keep wondering when Mrs. Duff served Fish Turbot. Was it a family meal? Is it a recipe she brought to the household or was it one of her husband’s favourites that she learned to cook for him? Or is it something she would serve at a luncheon with female friends? I think it would go well with a salad although I served it with boiled carrots and some leftovers. It is a good meal for anyone with difficulty chewing and it sticks to the fork — an asset for someone like my mother who is having to use her non-dominant hand after breaking her wrist this week. A modern cook might consider adding more fish or including other ingredients but it is a recipe that can time travel as written. Take a can of salmon, pour off all the liquid and pick out all bones and skin, have one-half pint of milk heated, in which an onion has been put for a little while, add to this one- quarter cup melted butter, and two tablespoonfuls of flour rubbed together, season with pepper and salt. When this mixture is cool add one egg well beaten, then take a pudding dish and put a layer of salmon and a layer of sauce till the dish is full, put grated bread crumbs on top and brown in the oven. The onion may be left out. Bake twenty minutes. Today is Good Friday, a special day for observant Christians. I’m going to make a recipe for Cod Fish for Breakfast In recognition that some of the contributors to The New Galt Cook Book in the 1890s would have abstained from meat today. This recipe was contributed by Mrs. James Young. I was able to buy some cod at the grocery store. It was already boned so I tried to flake it. It ended up a bit more like small chunks. Once I measured the fish I had enough to make one quarter of the recipe which suited me fine. I’m not a big fish fan. I put my 1/4 of a quart (1 cup) of cod bits in a frying pan and covered them with cold water. I turned the heat to low and then gradually brought it higher. Once the water was simmering I turned the heat down to maintain it and started timing. After 20 minutes I removed the pan from the heat. I wondered if I should have skimmed it as there was a bit of foamy scum. I went ahead and drained the water saving the fish. I returned the fish to the pan and the pan to the burner. I added 1/4 ounce (1 teaspoon) of butter and 1/2 cup of milk to the pan . Once it was starting to heat up I put 1/2 teaspoon of flour in 1/4 cup of milk and stirred until it was well blended. When it reached boiling I added the flour milk mixture and stirred well. I left it to boil for a few minutes stirring occasionally. I definately started to thicken. Now I had to decide what to do about the egg mentioned aat the very end of the recipe. Should I add it? It isn’t mentioned among the ingredients at the beginning of the recipe but then neither is pepper. I was leaning towards skipping the egg but realize I was avoiding it since I don’t like them and how would I quarter one egg? I finally decided to remove a serving of the fish once it was done and then continue with the recipe. I beat an egg and added 1/4 of it to the fish in the pan. I stirred and then removed another serving to sample. Which version would be better? Mrs. James Young contributed many recipes for The Galt Cook Book including others for fish. She helped launch the Ladies’ Aid Society at Central Presbyterian Church in 1880 and was also instrumental in creating this cook book as a fundraiser for the church. She was born Maggie McNaught in Dumfrieshire Scotland about 1838. Her parents immigrated with their four children to Canada and lived in Fergus Ontario for a time. More children were born and the family later moved to Brantford and Paris Ontario. It was in Paris that Maggie married James Young in 1858. They moved to Galt where James was a printer along with other family members. The couple lived a comfortable life in a large home in Galt and James eventually became involved in politics. Mrs. James Young died in Galt when she was 90 years old. 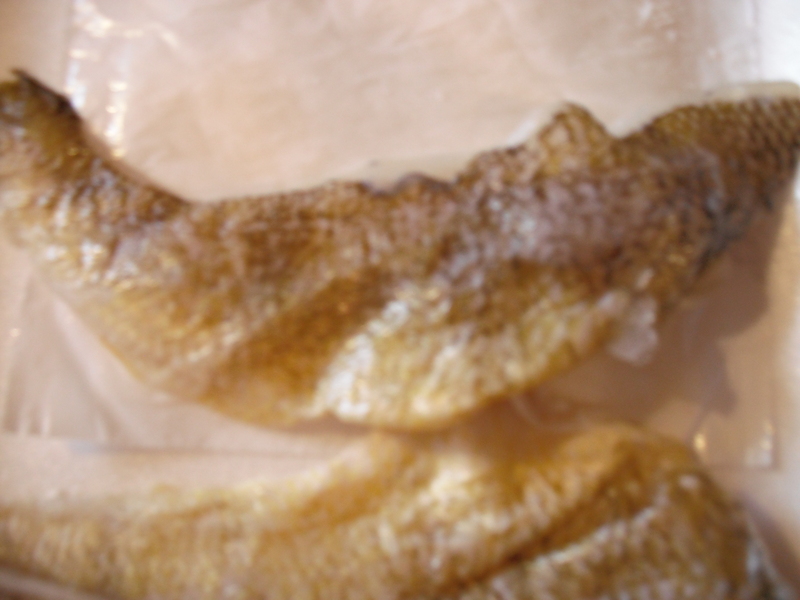 Cod Fish for Breakfast is a good breakfast meal. I suspect that the recipe is intended for salt cod rather than fresh cod fish but it worked. Adding egg will appeal to some people but i wasn’t to my taste. Although I prefer cereal for breakfast this meal would be a nice change. The fish was milder than I expected. Cooking it in water first seems to get rid of any “fishy” taste. I wonder what was served with it for breakfast and whether this was a family dish or could be given to guests too. 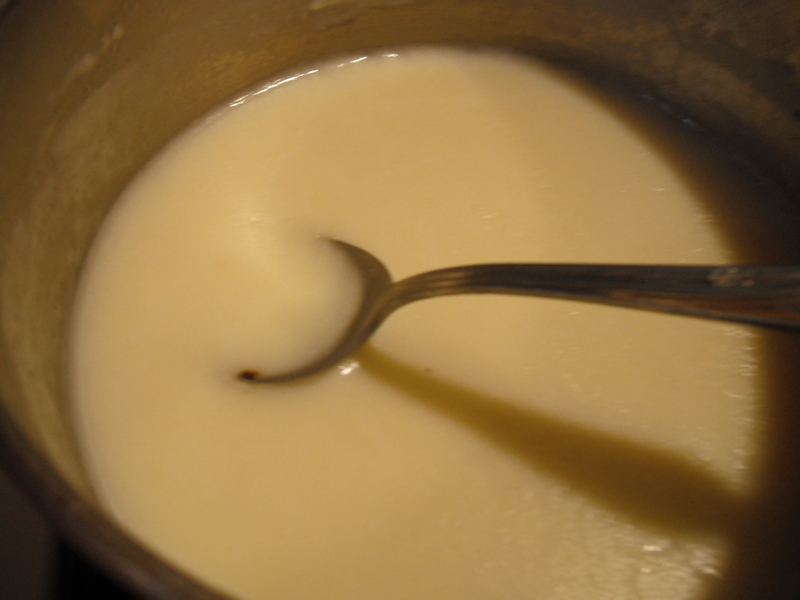 One quart finely shred cod fish, one ounce butter, one and a half cups cream or milk, two teaspoonfuls flour. Remove all bones from the fish, lay in frying pan well covered with cold water, let it heat gradually, simmer for twenty minutes, drain it, add pepper, butter, milk or cream, reserving a little of this for the flour which must be rubbed into it gradually to keep it smooth, when it begins to simmer add the flour, let it boil two or three minutes, then add the beaten egg, slip on a platter and serve. I decided to prepare fish for my father’s birthday since he used to go fishing every summer. I found some salmon at the grocery store but also some Lake Perch, a fish I was sure my father liked and had probably caught at one time or another. It is also a local fish so would have been around in 1898 too. I planned to cook both the salmon and perch using the recipe from day 86 but to also try the recipe For Boiling Fish and to make White Sauce which can be served with salmon. That recipe was contributed by Mrs. James Young for The New Galt Cook Book (1898). I made the white sauce first since I could reheat it if necessary and the fish needed to be cooked just before serving. I’ve made lots of white sauces over the years. This recipe leaves out some directions. I make a roux first. That’s when you combine the butter and flour and heat it in the pot first before adding the milk slowly stirring continuously so that it becomes smooth. The heat shouldn’t be too high. It always seems a bit magical when the milk suddenly starts to thicken. Once the sauce was a sauce, I added salt and pepper and some lemon juice. I’ve never had a white sauce with lemon and I’m looking forward to tasting it. Next I prepared the fish. I started the salmon frying and then added the little perch. I also put one of the perch in a small pot of cold water and turned on the heat. I was using a gas stove and had to be careful since things heat up much more quickly. As soon as the frying fish were done I put them on a plate and as soon as the water came to a boil I removed the pot from the heat and then removed the fish. It also went on the plate. It was time for supper. I’ve talked about Mrs. James Young several times. She is Margaret McNaught and her husband was an MP and involved in all sorts of community events. Margaret was also active in community work especially with her church Central Presbyterian in Galt. She would have experience with entertaining guests I imagine and probably use white sauces often. The white sauce with lemon was very good and it went well with the salmon and with the boiled fish too. My little perch was okay boiled but it could have been any fish when cooked that way. 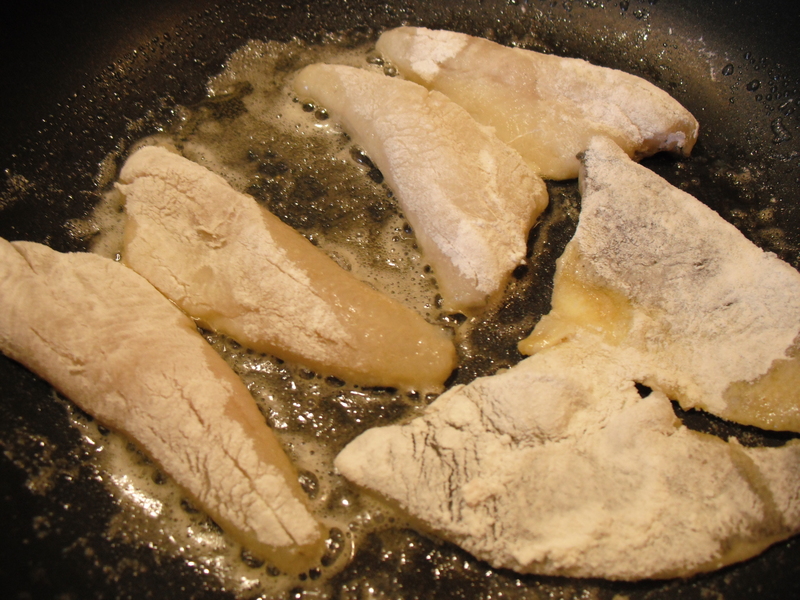 I think frying lets the particular flavour of the fish shine rather than disappearing into the water. It cooked just as quickly and without added calories — well except for the addition of sauce when serving! I’ll try this method again during the year using a larger fish as described in the first part of the recipe. For boiling fresh codfish and all large fish, except salmon, let them lie in salt over night; when ready to boil put them in a kettle two-thirds full of boiling water, add vinegar and salt, place the fish on a drainer (or roll in a cloth), put it into the boiling water; for a four-pound fish let it remain thirty minutes boiling rapidly. For salmon put it to boil in tepid water and thoroughly skim; allow the same time. For small fresh-water fish use cold water as soon as they boil they are cooked. For salmon and white fish, one cup of cream or rich milk, two ounces of butter, two teaspoonfuls of flour, salt and pepper to taste. 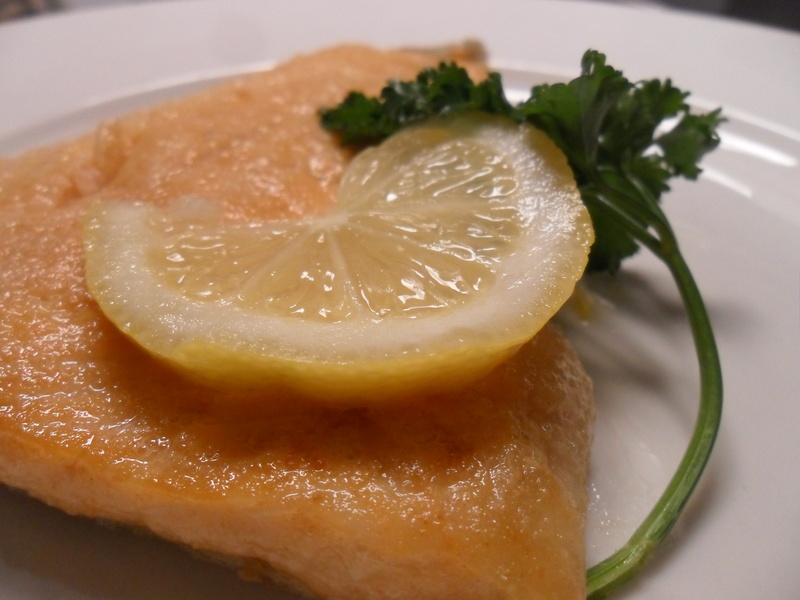 If liked, a little lemon juice is an improvement, or a little parsley cut fine. I seem to be finally facing up to some of my most challenging sections of The New Galt Cook Book (1898). Today it is the Fish chapter. I have limited experience cooking fish, and although I know it is good for me, I rarely eat fish. While shopping at my grocery store tonight I noticed that some fresh fish was featured. A small piece of rainbow trout caught my eye and since the price was also small I decided to risk ruining it with my inexperienced piscatorial cooking. So tonight I will attempt Mrs. James Young‘s recipe for Fresh Salmon Fried. Now before you shout “but rainbow trout and salmon are not exactly the same thing”, you should know that the recipe says it will do for all fish cut into steaks. I’ve also included the general information about Fish found at the beginning of the section. It was likely contributed by one of the editors of the cook book. Although my fish was not an entire fish, I did my best to check that it was fresh. 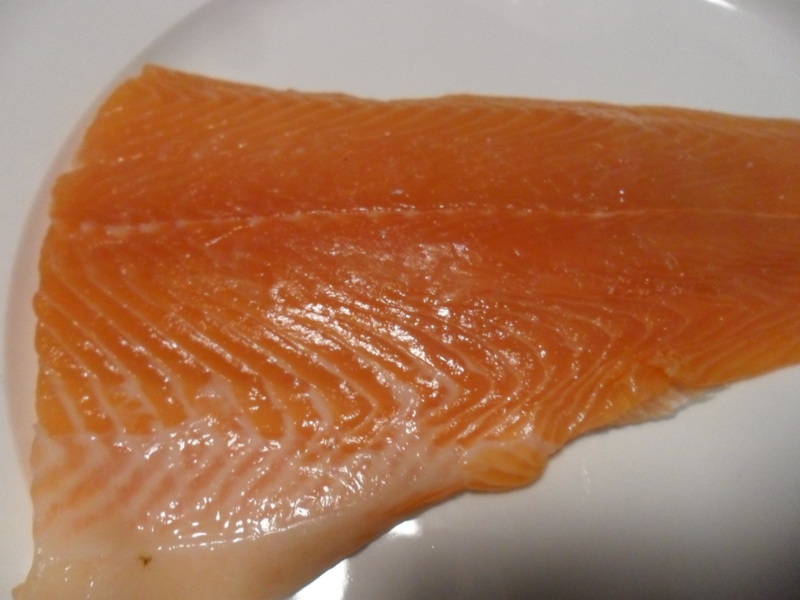 The flesh of my piece of rainbow trout was firm and odourless. 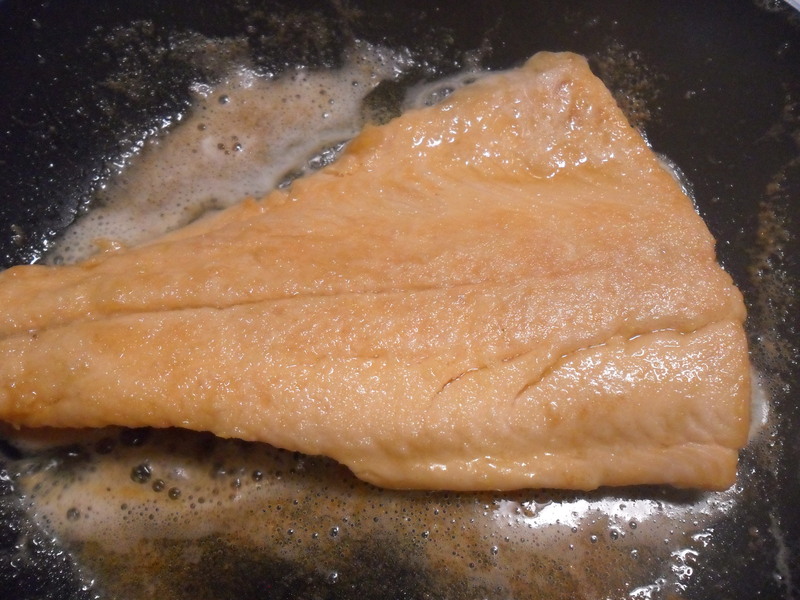 I decided to try the simplest version of the recipe and dredged the piece of trout in flour. The fish was slightly thinner than 3/4 of an inch but I felt it was still thick enough to work with this recipe. My brother goes fishing and enjoys eating fish too. He’s advised me to let the floured fish sit a bit and then dredge it again in flour. This helps it form a bit more of a crust when fried. I followed his advice and then put a bit of butter in a frying pan. Once the butter was hot I placed the trout in the pan skin side down. I kept the heat on medium and let it fry until I could see the visible flesh of the fish starting to change colour part way through. I turned the piece of fish over and let if fry on the other side. I flipped it back over to check if it was done. I didn’t have a fin to check so I used methods I’ve seen in cook books and on cooking shows. Instead I used a fork to check the consistency of the flesh. The fish was starting to flake and only a tiny bit of the centre was still translucent. I removed the fish from the pan, knowing it would continue to cook a little as it rested. I can’t tell you how long the piece of rainbow trout was in the pan but I don’t think it was even 10 minutes. I garnished it with lemon and parsley as recommended elsewhere in the Fish section and tried to get brave enough to taste. I have talked about Mrs. James Young (Margaret “Maggie” McNaught) several times and will write about her in future. Born in Scotland and raised in Brant County she was married in 1858 when she was 20 years old. The couple moved to Galt and lived there the rest of their lives. Mrs. James Young contributed many many recipes for The Galt Cook Book. Her husband was a member of the federal parliament at the time so she was a prominent person in her church and in the town of Galt Ontario. The Grand River flows through Galt and some sections of the river are still considered a good place to fish, along with all the many small rivers, lakes, and streams in the area. 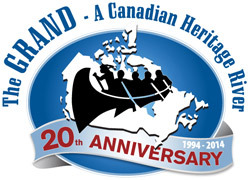 Twenty years ago this year, the Grand River was designated as one of Canada’s Heritage Rivers. You can read more about The Grand here and watch for special events during the year. Rainbow Trout ready to eat. Sometimes the simplest cooking methods are the best. This fish was absolutely delicious and you know it is high praise coming from someone who doesn’t like fish. 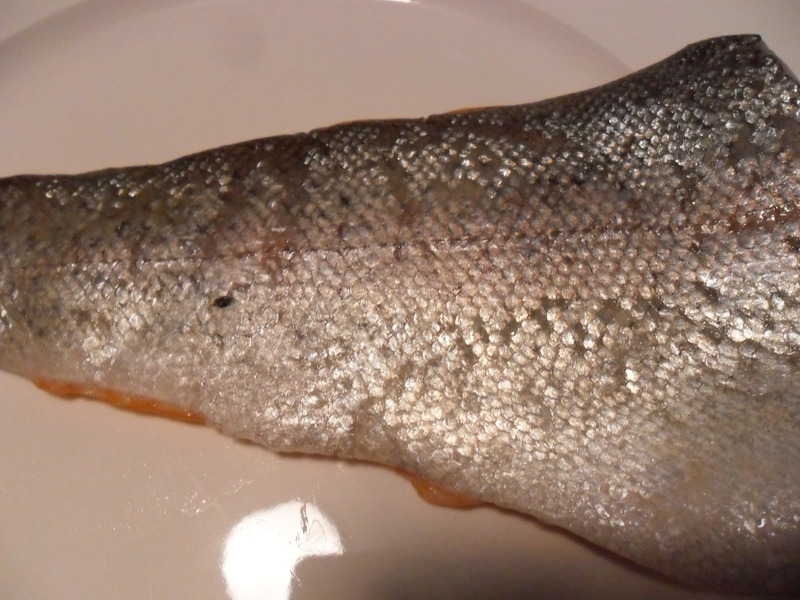 I managed not to over or under cook my precious piece of rainbow trout. It was flaky and moist and the only other flavour other than mild fish was butter. s I type this up I realized I forgot to even season it with pepper and salt! If you don’t already eat fish prepared in this simple way, then be sure to try it the next time you find a nice fresh salmon or trout fillet or steak. 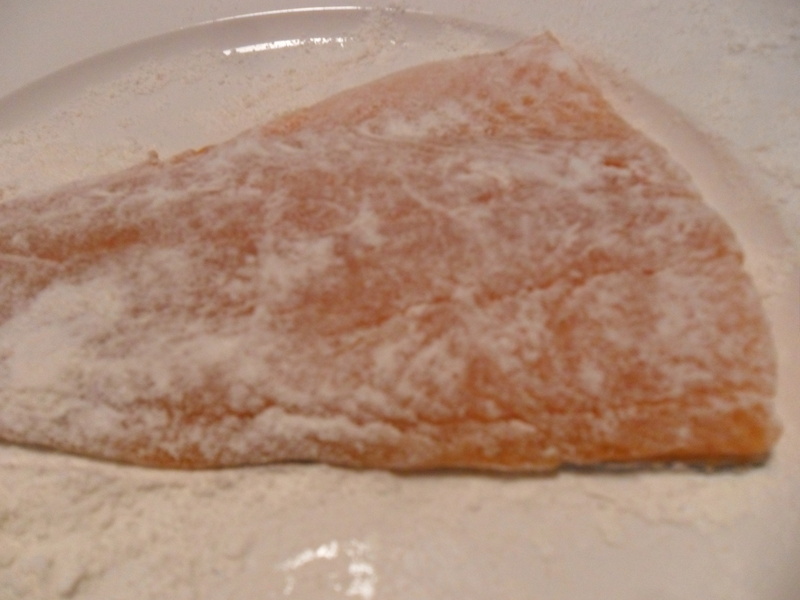 Cut the slice three-fourths of an inch thick, dredge with flour, or dip them in eggs and crumbs, fry a light brown. This mode will do for all fish cut into steak. Season with salt and pepper. Fish is either boiled, broiled, baked or fried. In all cases it is to be treated on the same principle as meat. When put to boil in cold water, fish, like meat, will part with it best substances, which will go to enrich the water it is cooked in. 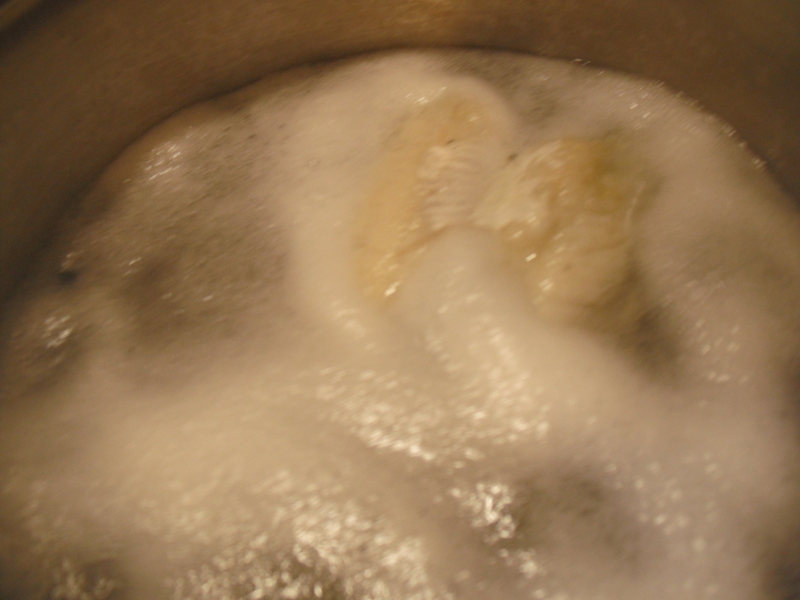 To make a soup of it, or a fish jelly (which is very delicate), this would be the right way but to boil fish that is to be eaten, it is necessary to put it into boiling water. To know the right moment when a fish is done is not such an easy affair as you might think. An underdone fish is disgusting while an overdone one is tasteless and mostly tough. After fifteen minutes from the time a fish has been put on the fire one has to be on the watch. If the fish is small or thin it most likely will not stand a second’s longer cooking. If large it may need half an hour to be well done, or even more. Experience and a certain fine instinct have to guide you. One sign – and a pretty safe one – is to try a fin. If it gives way easily to a slight pull, the fish is done. Fish, like meat which is to be dished up, has to be kept simmering rather than boiling after its first immersion in lively boiling water. When it is to be cleaned it must not be kept soaking in cold water. Some salt-water fishes are better for sprinkling them with salt inside and outside for about one hour before cooking them. The salt, of course, has to be washed off again. Be sure that your fish is always as fresh as possible. Never buy a fish whose eyes are dull-looking, or the gills of which are not of a fine red colour and the flesh firm and odorless.